It’s the time of year all our thoughts here in New Jersey turn to battening down the hatches for the winter season. An important part of that is winterizing sprinkler systems. If you’re asking, “When should I winterize my sprinkler system?”, you’re asking the right question. And the answer? Before the first frost hits, you need to ensure that the lines in your system are “blown out”. This means that all water is removed, to prevent the possibility of freezing. Water freezing in your sprinkler system lines can spell disaster. When water is trapped in your pipes and freezes, those pipes can rupture and that means a big repair job come spring. So, let’s review the steps which should be taken when winterizing your sprinkler system. At Wetscape, a Royal Irrigation Company, we’re experts in all aspects of in ground irrigation systems. As professionals, we use state-of-the-art equipment that gets the job done correctly, offering you peace of mind that your sprinkler system has been prepared to maintain it in good condition over the winter months. When we winterize your sprinkler system, we arrive with a professional grade air compressor. This is the tool we use to blow all remaining water out of your system’s lines, ensuring that it’s put to bed for the season properly. 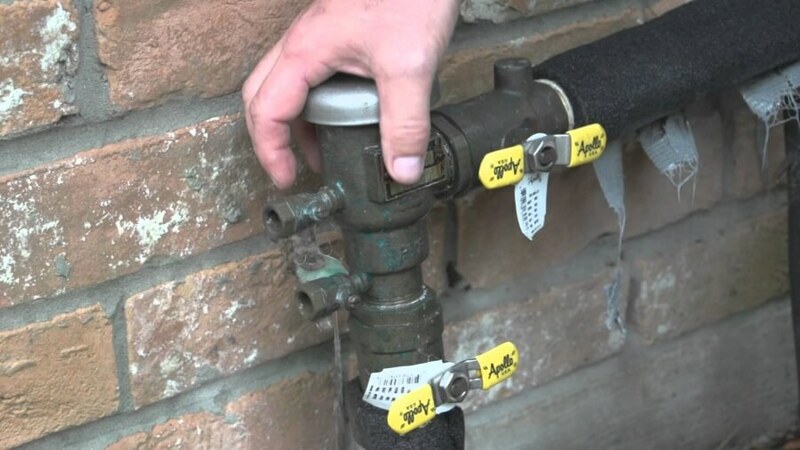 This is probably the most important service we provide when winterizing sprinkler systems, as an air compressor ensures that no water remains in your pipes, safeguarding your system. But it’s not all we do. Not only does your sprinkler system need to have all water removed from its lines, it needs to be thoroughly shut down, ensuring that it’s completely dry for the season. It also needs your backflow preventer turned off and disassembled. This is an important step you may not be aware needs to be taken as part of sprinkler winterization. Your sprinkler system should also be subject to professional inspection. Ensuring there’s no damage or dysfunction anywhere in your system gives you the green light to turn it back on in spring. Because we’re irrigation system experts, the folks at Wetscape, a Royal Irrigation Company, are skilled at spotting problems. If your system has challenges that extend beyond routine replacement and repair required by the winterization process, we’ll let you know. Then we’ll arrange to return in the spring, to ensure your sprinkler system is ready to go. Wetscape, a Royal Irrigation Company has been in the business of innovative irrigation systems for more than 20 years. We’re your source for all you need, where your sprinkler system is concerned. You’ve made an investment in a key amenity for your home. Wetscape, a Royal Irrigation Company, is here to ensure that it’s serving for you for many years to come. It’s that time of year – time for you to winterize your sprinkler system to protect it from the cold months about to hit. Contact us and let the professionals get your sprinkler system protected from the elements.